Watch out GameStop, you’ve got some pretty major competition on the way. This week, retail giant Walmart announced the company will soon buy your used video games to refurbish and resell. Starting March 26, you’ll be able to exchange your used video games for an eGift card all 3,100 U.S. Walmart locations. These games will then be sent for refurbishing and sold in-store and online as “Certified Pre-Owned” games later this year. Exchange values will range from a few dollars for older PlayStation 3 and Xbox 360 titles to “$35 or more” for newer releases. Heavily scratched, cracked or unplayable games will not be accepted for trade. 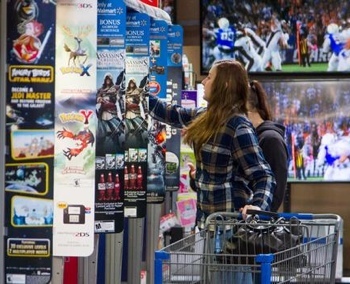 “While new releases will remain the focus of our gaming business, we’re glad to give our customers the option to buy pre-owned games,” says Walmart Chief Merchandising and Marketing Officer Mac Naughton. GameStop currently dominates the pre-owned games industry. Last year alone, the company’s Refurbishment Operations Center refurbished over 10 million software titles and 1 million consoles for resale. Half of GameStop’s profits come from the sale of used titles. It seems unlikely Walmart will gobble up all of GameStop’s business. The latter has been buying and selling used games for 15 years, building a large inventory and customer loyalty. And unlike Walmart, GameStop will buy your games for cash. Still, for us consumers, having more competition over our video gaming dollars is always a good thing. You can learn more about all your used games resale options by checking out our guide to getting the most money selling your old electronics. For more on Walmart’s coming used games program, visit the company’s blog.